1. 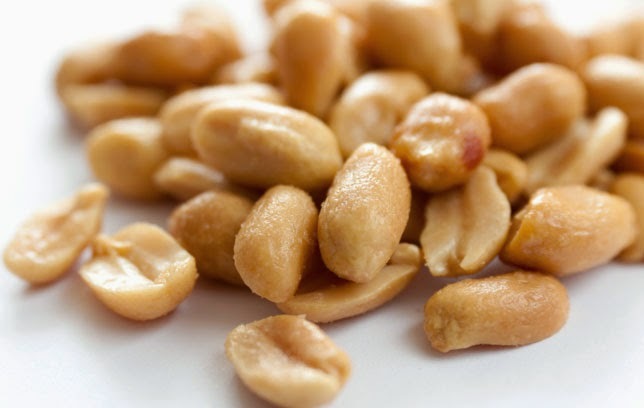 A Great Protein Option: Peanuts deliver 7g of protein per 1 oz serving – try to find another snack that does this. 2. Good Source of Niacin: Peanuts contain an important B-complex vitamin, niacin. In fact, a 1 oz serving of peanuts provide about 15% of the recommended daily value of niacin, a vitamin important in energy production. 3. Feel Satiated: The protein and fiber in peanuts can help satisfy your hunger. 4. Defend Your Cells: Antioxidant Vitamin E is found in peanuts. The antioxidant properties of vitamin E help protect cells from free radicals that damage the cell structure. 5. Fiber Never Tasted So Good: Peanuts are a good source of fiber, a 1oz serving delivers 10% of the Daily Value, and most Americans don’t get enough. 6. No Empty Calories: Peanuts deliver 7g of protein and 6 essential nutrients – that’s a powerful, nutrient dense snack. 7. Benefit Your Bones: Recent analysis shows less than half Americans get their daily recommended intake of magnesium—an essential nutrient which helps maintain the health of your bones. Peanuts are a good source of magnesium and an easy and portable way to make sure your reach your goal. 8. Mix & Match: Peanuts are a welcome addition to any kind of snack mix—perhaps, none better than dark chocolate, dried cherries or sunflower seeds. This combination not only adds taste and texture variety but also offers a compliment of nutrients, like vitamins C or A found in dried cherries or vitamin E, magnesium and thiamin found in sunflower seeds. 9. More Manganese: Peanuts are an excellent source of manganese, which helps the body to burn carbs. It acts as a co-enzyme to assist metabolic activity in the human body.